Imagine just clicking a button on an app and having your cars gas tank filled while you are working at the office. That’s what Booster Fuels is currently doing. Booster has brought the on-demand business model to fuel and it’s extremely popular in its launch markets of SF Bay, San Diego, and Dallas-Fort Worth areas. Booster Fuels co-founder and CEO Frank Maycroft says that they are selling over $180,000 per day in just those three markets and have plans to expand nationwide. Amazon set a new expectation for retail. People want to push a button and get same-day free delivery. What we are able to do now is the same thing for gasoline. When you think about a gas station it hasn’t changed much in 50 years. The concept is really taking the old-world industry and leveraging mobile technology, machine learning technology to allow us to deliver gas to people without any of the inconvenience. We are the only company quietly roaming through parking lots looking for cars. 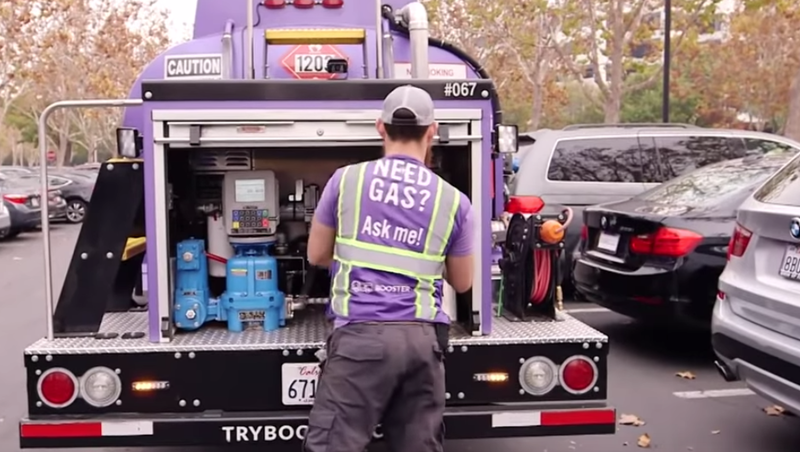 The truck that does that has to fit within a single parking spot, has to maneuver as well as a small car, has to be connected to the cloud and communicating with all of the other mobile distributed gas stations in the Booster fleet. We’ve done more than a million deliveries company-wide and we will do about $180,000 of revenue in a single day. Anybody can make it so that you can push a button and get gas, but doing that in a way that doesn’t cost more than the gas station is incredibly hard. We didn’t want to have to build a subscription service. We didn’t want to have to charge fees. Our belief is service everyone by charging the same price and focus on where cars go all the time, parking lots. To really be inventive today you have to start from scratch with the context of what would this have looked like if you started it in the 21st Century? It’s hardware with embedded systems with software that’s communicating to the cloud, it’s procurement of fuel, it’s pricing to customers. When it all comes together that’s where the magic is. People Spend More on Gasoline Than They Do For All of Ecommerce. We like to be realists that when you look out your window there are gas-powered vehicles and that’s going to be here for a very long time. Let’s make them 3-5 percent better by improving the supply chain, reducing emissions, and reducing miles traveled. People spend more on gasoline than they do for all of ecommerce. People spend almost as much on gasoline as they do on groceries as a category. At the same time, we do look at alternative energy solutions. Nothing stops us from doing the same service for electric vehicles or other alternatives. It’s all based on the same technology investment, software, routing, logistics, that works for fuel. Nine out of ten Americans still drive to work and are either going to or coming from suburbs. Imagine ten years from now not having to think about gasoline or energy in general or things in general just getting to you where it’s most convenient for us to deliver to, most convenient for you to get it, and most cost-effective for the entire ecosystem. I think that is the way that the world is moving.